On April 11, 2018, bank sponsor Ridge Top Ranch LLC and staff from WRA, Inc. provided a tour of the property to 11 U.S. Fish and Wildlife Service staff. 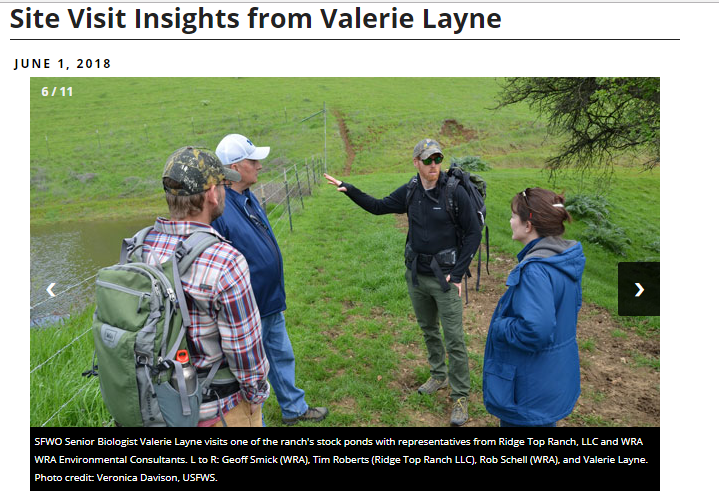 Valerie Layne, senior fish and wildlife biologist, Sacramento Fish and Wildlife Office (SFWO) Conservation Banking Division recently published a summary of the site visit. Click here to read the full article. Please explore our website for more information or view the brochure here.